If you are one of those programmers that like to test their applications in all operating systems available, then you are probably using Virtual PC (or some other Virtual Machine software) to make your life a bit easier. Easier because you have multiple operating systems on one computer without using dual boot and having to restart your development operating system and applications/tools. If you have VirtualBox then check my other article for VirtualBox. Presumably you already have Visual Studio and Virtual PC installed so let’s start. First you have to configure your virtual machine network adapters so that your host and guest operating systems can communicate with each other. 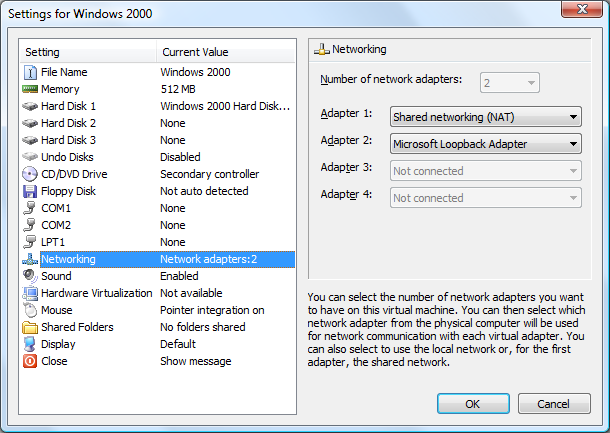 When it comes to configuring Virtual PCs network adapters, I select “Shared networking (NAT)” for my first adapter because I want to have internet connection from my host computer and for my second adapter I select “Microsoft Loopback Adapter” which is the key to host and guest operating system connectivity. “Reply from 169.254.125.150: bytes=32 time=1ms ttl=128”. In case you don’t get a reply there is probably some software blocking the connection and you should try to configure windows firewall or some other security software that you have installed in your guest operating system but that is beyond this article. Find Remote Debugger in your Program Files where Visual Studio is installed, for Visual Studio 2008 location is “C:\Program Files\Microsoft Visual Studio 9.0\Common7\IDE\Remote Debugger”. Copy Remote Debugger to virtual machine, location is not important, just remember where you put it so you can find it later :). Copy your binary files into the virtual machine OR create a “Shared Folder” to your applications folder. Second option is better because you don’t have to copy your binary files every time you compile them. NOTE: You should make a new configuration for your project in Visual Studio if you will be doing this remote debugging a lot. If you just change the properties of your current “Debug” configuration than you will have to change following settings manually every time you want to switch between local and remote debugging. I should mention that non authenticated connection is not secure but that should not be a big deal for connection between host and a virtual machine. 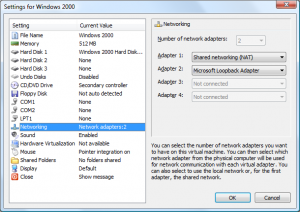 Multiple virtual machines can be run with one Loopback adapter (no need to install new one for every virtual machine). Everything said here works also for Sun’s VirtualBox (and probably for VMWare). hey i found your blog today and I have read some great posts over here. I just wanna thanks you for posting it so we all can learn about it! Thank you spammer man! I hope you don’t mind me removing all the spam links from your comment?